The California Market Center is the newest marketplace for fashion, gift & home. Located at the corner of Olympic & Main in downtown Los Angeles, the CMC is helping retailers redefine modern merchandising. Nowhere else can wholesale buyers find such a fresh array of goods including women's wear, men's wear, children's wear, toys, gifts, decorative accessories, furniture & décor, home textiles, garden accessories, stationery, footwear, fashion accessories and personal care products. This unique blend of stylish goods across multiple product categories could only happen in California, 5th largest economy in the world and the place with a reputation for where things start. The California Market Center is the hub for the style industries in Los Angeles. As the newest marketplace for fashion, gift & home, the CMC is helping retailers redefine modern merchandising. With more than 1,000 showrooms and nearly 10,000 product lines housed in three 13-story wings there is nowhere else that wholesale buyers can find such a fresh array of goods including women's wear, men's wear, children's wear, fashion accessories, swimwear, footwear, gifts, toys, furniture & décor, textiles, garden accessories, floral, stationery, intimate apparel and personal care products. This unique blend of stylish goods across multiple product categories could only happen in California, 5th largest economy in the world and the place with a reputation for where things start. The CMC is open daily, and hosts five major fashion markets, two textile markets and four gift & home markets each year in addition to a range of market days, fashion weeks, educational events, and seminars throughout the year. Within each of these major markets is a variety of category-specific specialty markets, such as the LA Shoe Show during fashion markets, Technology-by-Design during the L.A. Textile Show and the Garden District during gift markets. Fashion markets in the Spring and the Fall are timed with Fashion Week runway shows. Go to www.fashionweekla.com for a schedule of runway events. 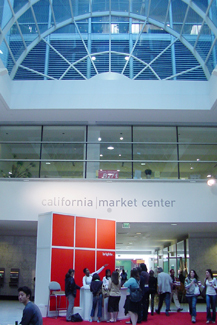 Learn more about the California Market Center at their official website. Learn about VIEW at the California Market Center. Summary: The California Market Center is the hub of the Los Angeles fashion industry. Located on 9th & Main in downtown's Fashion District, the CMC is home to hundreds of wholesale showrooms for fashion, textiles, gifts and home decor, in addition to a range of offices, studio spaces, fashion design schools, restaurants, cafes, shops and special event venues. Visited by thousands of retailers, designers, manufacturers, press, stylemakers and influencers from around the globe, the CMC is open daily and hosts a busy Calendar filled with Markets, tradeshows, seminars & events for the fashion & textiles industry, in addition to exclusive events and sample sales open to the public. Learn more about LA fashion at the new LA Fashion website. Check the California Market Center Calendar of Events.